When Kurt Cobain felt the cold steel barrel of his shotgun rest against his lips in the fateful moments before he said goodbye to the world, one wonders what his final thoughts were. The pressures of life as a famous rock star were certainly on his mind; his small-town, punk-rock background did not sit well with fame and fortune; and it would be an understatement to say that he had become chronically disillusioned and depressed by the cynical business side of the music industry. His suicide note provides us with an insight: “I feel as if I should have a punch-in time clock before I walk out on stage” he scribed, presumably minutes before his death. The life, it seems, had been sucked from him long before he died – he felt like a stooge, a parody of himself – he may have pulled the trigger, but the industry handed him the gun. 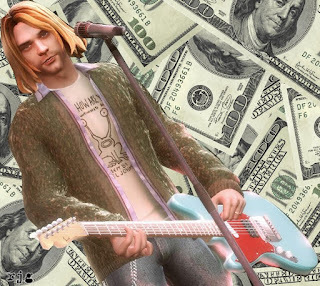 The latest chapter of Cobain’s legacy has in recent weeks taken yet another controversial turn – he has been resurrected to feature in Guitar Hero 5, where players can not only use Cobain’s character to jam a couple of Nirvana classics, but in a cruel and perverse twist can also use his figure to play along to a range of cheesy rock hits, such as You Give Love a Bad Name by Bon Jovi. Cobain must be spinning in his grave (well, he would be if he hadn’t been cremated). Should we be at all surprised by Cobain’s posthumous exploitation? After all, it’s no secret that dead celebrities are big business – since Tupac Shakur died in 1996, he has released five ‘new’ albums; Elvis still manages to chart on a yearly basis; and John Lennon still generates an estimated £12.7m per year. The difference though is that Lennon, Elvis and Tupac were all comfortable with the fame and the money; each of these artists were heavily ‘branded’ during their lifetimes and in fact were among the first to truly embrace the commodification of the artist as celebrity in the modern sense. In contrast, Cobain hated the notion of ‘celebrity’ and rejected his own fame. He killed himself in large part because he couldn’t handle the commercialization of himself and his band – therefore surely it is unethical and immoral for this man’s image not only to be used to sell a computer game, but for that same image to be used to perform the kind of stadium rock anthems and power-ballads that Cobain himself, whilst alive, rallied against. Unfortunately for Cobain though, the second his heart stopped beating was the same second his legacy and his ‘image’ shifted from his hands into the hands of another. The individual who now controls how he is sold to the world – his widow, Courtney Love – is an individual who never shared his principles; Love’s actions have repeatedly illustrated the stark contrast between her and her husband – she is not reclusive, fame shy, or anti-corporate. If anything else, Love is a shrewd business woman. Cobain’s estate has in recent years generated in excess of £30m p.a; more even than Elvis, Marilyn Monroe, Bob Marley or Johnny Cash – and this is all down to her. In 2002 she sold his private journals to a publishing house for £2.8 million, in 2006 she sold 25% of her stake in Nirvana’s back catalogue for £29 million, in 2008 she allowed Converse to manufacture a special edition Cobain Shoe complete with scrawlings from his journals all over them and now, in 2009, she has sold his image to the Activision group allowing him to appear in Guitar Hero, causing a backlash from fans and his former band mates alike.